When you need to improve in all four TOEFL sections, it can be hard to know just where to start. Figuring out exactly what you should do next is a matter of asking yourself the right questions. You need to carefully assess your own strength and weaknesses on the TOEFL. Once you look at your own abilities, you can identify and prioritize your areas of weakness. You can focus your studies on the parts of the test that are hardest for you. And you can set aside time for specific English skills that you need more practice in. You should also be aware of your TOEFL strengths. If you’re very good at certain aspects of the TOEFL, you’ll want to practice those strengths regularly, so that you don’t lose any abilities. You also want to find ways to connect your strengths to your weaknesses. Suppose, for example, that you’re pretty good at TOEFL Listening and Reading, but that you are less confident in TOEFL Speaking. You can use your listening and reading skills to boost your score in TOEFL Integrated Speaking. Which TOEFL sections are hardest for me, and which are the easiest? Which TOEFL Reading question types are the most challenging for me, and which ones am I the strongest in? Which TOEFL Listening question types are harder for me, and which are easier? What is easier for me, TOEFL Independent Speaking or TOEFL Integrated Speaking? Which individual TOEFL Speaking tasks are harder or easier for me? Which of the two tasks in the TOEFL Writing section are easier or harder for me? 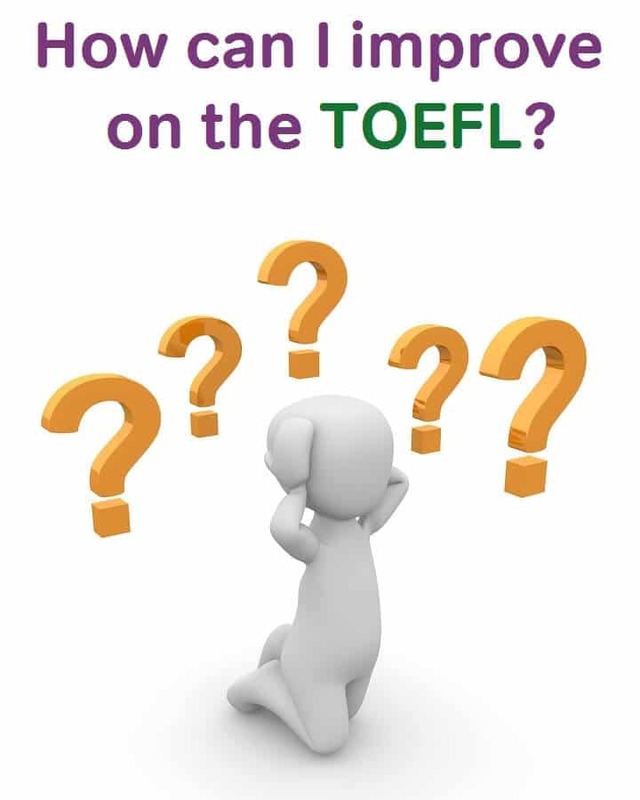 Once you’ve identified both your TOEFL “trouble spots” and your TOEFL strengths, you need to ask yourself why certain aspects of the TOEFL are easier or harder for you. As you carefully look at your TOEFL abilities, you’ll be able to see a pattern behind your TOEFL performance. You may notice, for instance, you’re confident with vocabulary questions in TOEFL Reading. But at the same time, you may realize you’re doing poorly in TOEFL reading inference questions. This shows that you have a strength in knowing English words, but a weakness in understanding broader meaning in context. You can use your vocabulary strengths to pay more attention to context-based inferences in the readings. Or you may notice that you are good at summarizing the lecturer’s words in TOEFL Integrated Writing, but not-so-good at paraphrasing the Integrated Writing passage. This indicates strong listening skills, but possible problems with reading or writing in English. So again, you can make a plan of action to work on your weaknesses while using your strengths to improve. I could give a lot of other examples of possible strengths and weaknesses. But the real question is this: What will you discover about yourself as a TOEFL test-taker and English learner, and what will you do with this knowledge?